RATG is a great way to get started if you are new to Retrieving. RATG is a test of basic obedience and retrieving skills and is often taught as an extension of Obedience club activities. RATG tests are mostly held at Obedience trials or Dog show events to promote Retrieving, and are only open to registered gundogs. There are two levels of the Retrieving Ability Tests for Gundogs: Novice and Open. The Novice level is judged out of 100 points and includes obedience and retrieving components. These consist of four exercises; walking to heel for 30 metres, a "stay" and recall, and two single mark retrieves. The first two exercises are each worth 15 points. The obedience part of the test is not as demanding as the Novice level of Obedience trials, but is intended to demonstrate that the dog is under a handler's control. To attain a qualifying score, a dog must receive at least 50 per cent of available points in each exercise and an overall score of not less than 75 percent of available points. The handler may use whistles, voice and hand signals to control the dog, which must complete all exercises without lead or collar. The Open level is a higher level of testing. Open competition is also judged out of 100 points. Open tests consist of four exercises; walking to heel, one minute stay with recall (incorporating a stop on command), walk-up retrieve, and either a double mark retrieve or a double rise retrieve. As in the Novice competition, the first two exercises are each worth 15 points and a qualifying dog must earn at least half of the available points in each exercise, and no less than 75 per cent overall. Voice and hand signals are perfectly acceptable, as are whistles, but leads and collars must be removed. Guns are not used in RATG, but are used in Retrieving and Field trials described below. If RATG interests you, get in touch with your local Obedience club to see if they participate in it. If they don't, chances are they will know of a club nearby that does. To see a RATG in action, click here to find an event near you. To download a copy of the ANKC rules for Retriever Ability Tests for Gundogs click here and scroll down to "Retrieving & Field". Retrieving Trials place more emphasis on a dog's retrieving abilities across natural terrain. Like RATG, Retrieving Trial (RT) competitions are only open to registered gundogs. A little travel is usually required to compete in RTs. Whereas, RATG are mostly held on town ovals or dog club grounds, RTs require more challenging "hunting like" conditions and are commonly held on country properties. RTs involve more activities than RATG and require more time to conduct, typically 6 to 9 hours depending on numbers of entrants. Retrieving Trials are usually held over weekends and contain multiple Stakes (competitions). It is not necessary to run in all Stakes at a trial. Each Stake typically consists of 3 to 4 runs (tests). Each run includes heeling and basic obedience in the control area, plus the retrieves. Unlike, RATG, RTs do involve the use of a shotgun supplied at the trial, but only to simulate hunting like situations. No live ammunition is ever used or present at trial sites. 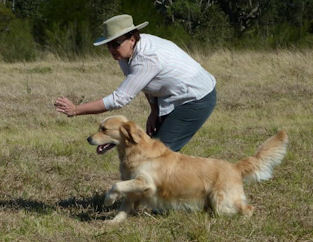 Retrieving Trials are slightly more demanding than RATG and are designed to test a gundog's abilities at higher levels. This does not mean RTs are a less preferable place to start Retrieving. On the contrary, RTs are highly exciting and rewarding for both dog and handler, and competitions are divided into three levels based on a dog's abilities and achievements. Points are awarded or deducted by a judge on each run according to the dog's performance. Retrieves may be set, up hills, through gullies and thick cover. The cover may include tussocks or long grass which conceal the retrieve and force the dog to use its nose to scent out the item to be retrieved. In the RT 'Control area' (where the handler must send the dog from) the handler removes the lead and collar and takes the gun, and heels to the ‘firing’ point, the handler (or a gun steward) fires a primer (a blank) used in the shotgun next to or near the dog. The handler then sends the dog for the retrieve and may use voice, whistle, and hand signals to control the dog if necessary, however the less assistance given the high the score will be. In all RT levels, at least one run must involve the dog retrieving through or into water. Usually in small dams, ponds or creeks. Most RTs are held in the colder months so the water can be quite cold and the dog must face the challenge. Novice is the introductory level where retrieves of up to 100 metres can be expected. In Novice, only one retrieve, a mark, is collected per run. A 'mark' is a retrievable item (usually a dead pigeon) that is cast into the air where the dog can see it. The next level up is Restricted, and the top level is All Age where retrieves may be up to 150 meters away from the handler. 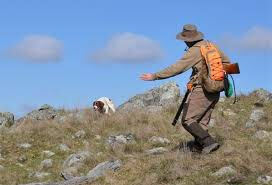 In Restricted and All Age, multiple retrieves are required for each run and usually include at least one 'blind', where the item to be retrieved is hidden and the dog must hunt for it by following its handler's directions and using its scent. Qualifying Restricted and All Age dogs are able to compete in State and National Championships that are held once a year. In addition to the above, many clubs hold Beginners Tests or Training days during the year where beginners are shown the fundamentals of trialling and are able to try their dogs on simple runs in a friendly and helpful atmosphere. To find a Beginners Test or Training day, or to see a Retrieving Trial in action, click here or get in touch with one of the Gundog clubs listed here. To download a copy of the ANKC rules for Retrieving Trials, click here and scroll down to "Retrieving & Field". Unlike RATG and RT, Field Trials (FT) are tests based on real hunting situations and are therefore held in rural and regional areas. Field trials are based on the idea of companions going out for a day's shooting. Dogs work in braces 'Pairs' and must 'point' the game (excluding Spaniels & Retrievers FT), with the second dog backing up the first dog ('honouring'), flush the game, and then retrieving the shot game. There are several FT categories, including trials for Spaniels and Retrievers; Pointers and Setters; and Utility Dogs. There are normally fewer Field trials held each year than RATG or RT and some states are more active with these trials than others. Trials are mostly run on rabbits, but dogs finding and flushing other legal game will be scored with a 'find' by the judge. If the game is out of season it cannot be shot but the dog will still be given a score for the find. Field trials are judged on a point scoring system and dogs run in two heats (provided they are not eliminated in their first heat). Shooting accuracy is not the main criteria in scoring, the trials are to test the dogs and not the aim of the handler. Retrieving is the only purpose that shooting is connected with and the retrieving performances of the dogs make up most of the scores. 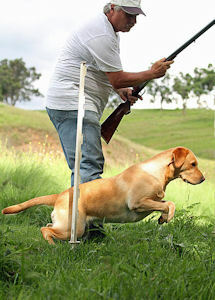 Handling a gun is not always compulsory and, in some instances, rules may allow for a judge to appoint a ‘shooter’ so that all the dogs can be tested with a retrieve. So, if you have a great dog, but are not overly fond of guns, don’t be put off Field trials. Contact your local club to find out what the licensing requirements are in your state. If FT interests you, check here to look for future trials. To download a copy of the ANKC rules for Field Trials click here and scroll down to "Retrieving & Field".